Ravensforge Coneg, LLC based in the great Pacific Northwest, was established in 2007 with the merger of Ravensforge and Coneg Products. It's two consumer product divisions are Ravensforge SkateBlock® and Coneg Products. 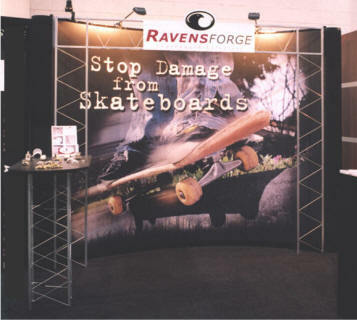 Ravensforge, since 1999, has developed SkateBlock®, the premier deterrent devices for preventing skateboard, in-line skate and bicycle damage to business, private and governmental property. Coneg Products was founded in 2006 with the express purpose of bringing a variety of unique, innovative & high quality products & services to the marketplace. In 2007, Coneg Products merged with Ravensforge to form Ravensforge Coneg.